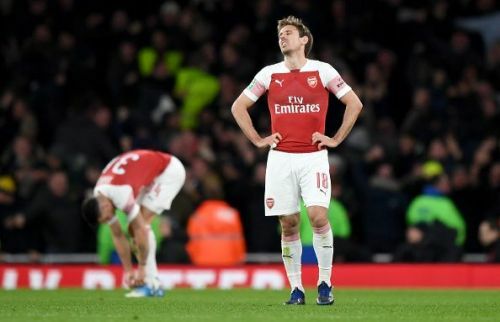 It was a chilly evening at the Emirates, and Arsenal fans had to witness their team losing their second game this week after having gone on a 22-game undefeated streak. 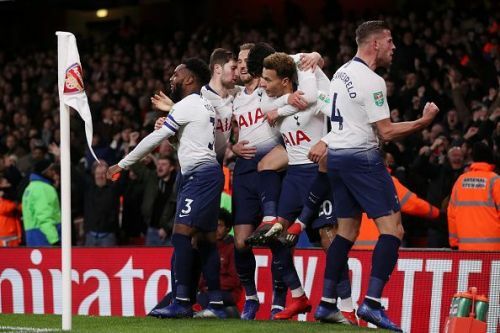 Tottenham booked safe passage into the semis at the expense of their north London rivals, courtesy goals from Son Heung-min and Dele Alli, as the team held on wave after wave of Arsenal attacks and preserved their clean sheet against an opponent who wiped the floor with them not so long ago. Arsenal suffered due to their defensive injury crisis, as they had to play without Hector Bellerin, Saed Kolasinac, Shkodran Mustafi, and Rob Holding, starting with a makeshift backline consisting Granit Xhaka at CB and Maitland-Niles as RB. Mesut Ozil's absence certainly didn't help the Gunners either, as they sure could've used the German's excellent technical ability to get a better grip on proceedings in the final third. Spurs started a strong lineup too but rested key starters Harry Kane and captain Hugo Lloris. Kane did come on at the hour mark to assist Dele Alli's wondergoal, and Lloris' replacement Gazzaniga was shaky as he was excellent, launching the passes that lead to both goals. Spurs shocked Arsenal near the 20th minute, as Gazzaniga lobbed a ball into Arsenal territory, which was controlled by Alli and sent into the path of Son. The Korean made simple work of the pass, lobbing it past Cech's reach into the corner of the net. Mkhitaryan got into several great positions but was extremely poor with his end product, and was hooked at halftime for Laurent Koscielny as Emery looked to switch things up. Arsenal blazed through Tottenham far too easily, but failed to take their chances, or were denied by some brilliant defending and good saves. Both managers showed their hand at the hour mark though, and with the game at a narrow 0-1, Harry Kane and Alexandre Lacazette came on. It was the former that made the telling impact on the match, as Kane chested down a superb Gazzaniga pass and played Dele Alli through on Cech's goal. The Czech keeper rushed to hurry Alli, who slotted the most exquisite of finishes into the far corner of Cech's unprotected goal. It was one of the best goal's I've seen in quite a while, and it deserved to be the winner. Here are the talking points from Tottenham's victory. Tottenham finally broke their Emirates hoodoo, winning at the Gunners' home for the first time since 2010, back when Gareth Bale and Luka Modric weren't winning trophies on an annual basis. Even then it was a narrow 3-2 victory secured by a later winner from Younes Kaboul. Remember him? It's been that long. But the current Spurs squad finally did it. They have been the better team than Arsenal indisputably for the last 2 seasons, but they always faltered at this ground. Alli &Co. weren't about to let that happen again today, and they didn't in great fashion.